← Children’s Ministry Training Day in Cork ~ the Photos! 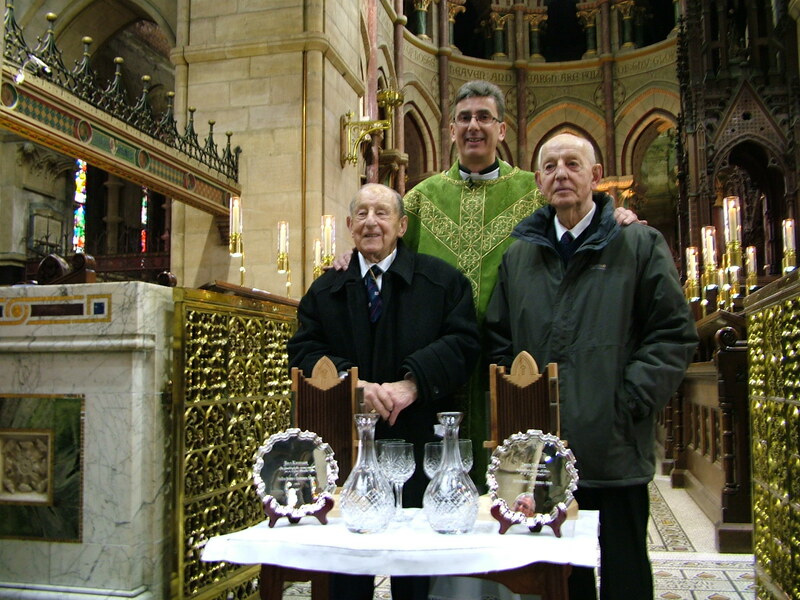 A very special celebration took place at the end of the Choral Eucharist in Saint Fin Barre’s Cathedral, Cork on Sunday 16th February when presentations and speeches of thanks were made to former choir members and members of the Select Vestry Mr Edwin Vincent and Mr Bill Cavanagh. l-r: Bill Cavanagh, The Very Reverend Nigel Dunne (Dean of Cork), Edwin Vincent following the presentation of gifts in thanksgiving for their decades of service to the cathedral choir and vestry at St Fin Barre’s Cathedral, Cork. Bill Cavanagh joined the choir in 1961 upon his arrival in Cork from Limerick (where he had been a chorister in St Mary’s Cathedral). Edwin Vincent joined the choir in 1963 upon what was supposed to be a temporary arrival to Cork from Dublin (where he had been a chorister in Christ Church Cathedral). Both were recruited by the then Organist and Master of the Choristers, Jock Horne, and went on to serve under Andrew Padmore, Colin Nichols and the present Director of Music, Malcolm Wisener. Cathedral parishioners, choir, family and friends joined the two men for a celebratory lunch held in the Cathedral Centre on Dean Street after the Service. This entry was posted in Cathedral, Diocese, People from the Diocese. Bookmark the permalink.